Hey there! From time to time I’ll go back to the old days and check out a few of the classics. The true test of a classic is how well they hold up today. 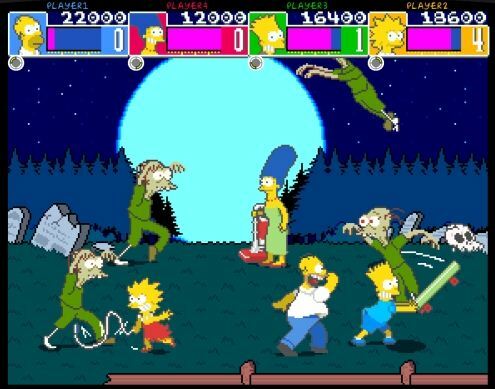 The Simpsons Arcade Game is a beat em up classic. Back in the glory days of the arcade, Konami was king with games like Ninja Turtles and the amazing X-Men Arcade. It wasn’t uncommon to see a group of people team up and beat the games from start to finish. Simpsons Arcade debuted in the spring of 1991 and looking back, you can really tell. Besides the Simpson family, you won’t find too many familiar characters. Mr. Burns and Smithers don’t sound the same as they do on the show, and some character models don’t match their counterparts from the show. Gameplay is the standard beat em up. 1 button for jump and 1 button for attack. Press both at the same time and you unleash a special attack that drains health. A nice feature is when playing co-op, if you stand next to another player you unleash a combo attack that will kill enemies with one hit. The enemies are standard goons with very little variety. Bosses can be cheap, killing you within 2-3 hits. This is standard arcade design, meant to eat your quarters. The game is a little on the short side. There are 8 levels ranging from the streets of Springfield to the showdown at Mr. Burn’s mansion. Simpsons Arcade can be completed from start to finish in about 30 minutes. 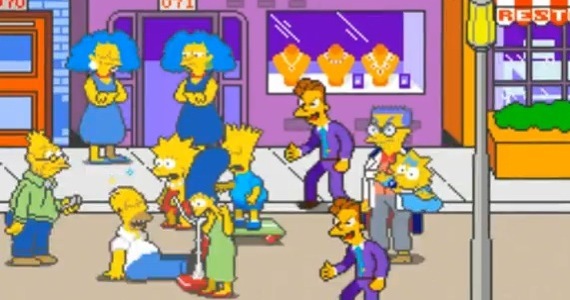 The premise of the game is simple: the Simpson family runs into Mr Burns and Smithers. They grab Maggie and a diamond, and now its up to the family to get Maggie back. 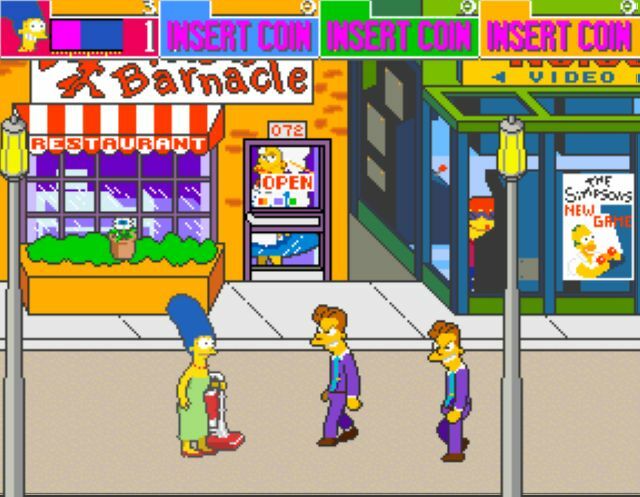 Simpsons Arcade shines with its multiplayer. There can be up to 4 players at once. If you can get at least one buddy to play you’re in for a blast. Online co-op is supported, but if you want the old-school feel you have to get together and play local. So how does the game hold up? Pretty well actually. Smooth and simple gameplay makes the game a blast even if it is on the short side. Its currently available on Xbox Live and PSN for $10 and I recommend it to fans of the Simpsons series and fans of old school arcade games. February 7, 2014 in Reviews.